No one has ever accused Stephen Harper of being dizzyingly charismatic. Few enthuse about how charming he can be in small group settings, or how naturally he manages the person-to-person challenges of retail politics, such as kissing babies or flipping flapjacks at the Calgary Stampede. And yet, while he’ll never be counted as one of Canada’s most charming politicians, Harper has been a remarkably successful leader, painting Ottawa’s House of Parliament Tory blue since 2006 and leading his party to Canada’s first majority government in over a decade in the 2011 election. How does he do it? And what has Harper’s unlikely ascendancy done to Canada? Donald Gutstein, Simon Fraser University professor and media critic suggests some answers to these questions in his new book Harperism: How Stephen Harper and His Think-tank Colleagues Have Transformed Canada. (Full disclosure. Like many B.C. journalists, I have known Gutstein and his work for decades, and we occasionally share space in the online newspaper The Tyee.) For Gutstein, Harper is only one of the political beneficiaries, together with Margaret Thatcher, Brian Mulroney, Christy Clark and George W. Bush, to name a few, of a worldwide network of right wing, “free enterprise” think-tanks, a sophisticated propaganda machine that promotes business-friendly policies and politicians and attacks labour unions, inconvenient scientific findings (such as evidence of global warming/climate change) taxes and government attempts to redress long-standing economic and social inequities. These think-tanks, Gutstein argues in his deeply researched, thoughtful and (mainly) even-handed book, have played a significant role in swaying public opinion and votes toward Harper, and in return have seen Harper-led governments take huge strides toward fulfilling the agenda (known as neo-liberalism) that informs their work — lower taxes, smaller government, weaker trade unions, an end to First Nations collective control of reserves in favour of individual private property, an end to environmental regulations that might reduce corporate profits and an effort to re-cast Canada as a Northern Rambo, a “warrior nation.” Neo-liberalism, Gutstein says, despite being often referred to as a conservative movement, is really an attempt not to conserve but to radically restructure existing social arrangements by creating more and more unregulated markets in every domain. The Canadian-based members of this think-tank network (locally represented by the Fraser Institute, founded in Vancouver 40 years ago, when business interests here were alarmed by the reforms instituted by Dave Barrett’s NDP government and turned to the U.K.’s Antony Fisher, a frozen chicken mogul who has played a key role in forming such right-wing idea factories around the world, for startup funding and counsel) spend over $26 million a year to influence Canadian public opinion and voting patterns. For Gutstein, the story starts with Friedrich von Hayek, the émigré Austrian economist who is widely recognized as one of the key intellectual voices in the triumphant, revanchist return of right wing political power in the developed world in the last half of the 20th century. Hayek played a key role in forming the Mont Pelerin Society in 1947, a body that Gutstein treats as the first right wing “neo-liberal” think-tank and the direct progenitor of the nearly 500 such organizations around the world. Harper based his graduate thesis at the University of Calgary on Hayek’s theories. Harper, of course, was not the only one in Canada promoting Hayek’s enthusiasm for a return to an imagined golden age of free markets. As noted, t The Fraser Institute was founded here in 1974, joining a small group of already existing pro-business think tanks like the CD Howe Institute. By the 1990s, Gutstein says, a new cohort of right wing think-tanks began to appear across Canada, including Halifax’s Atlantic Institute for Market Studies in 1994, the Montreal Economic Institute in 1999 and Winnipeg’s Frontier Centre for Public Policy in the same year. More recently, gold mogul Peter Munk’s Aurea foundation (founded in 2006) has become an important funder for neo liberal think tanks. And in the Alberta heartland, says Gutstein, a neo liberal think-tank has been established within the University of Calgary in the form of the School for Public Policy in 2009. All this expenditure (much of it subsidized in part by Canadian taxpayers, who underwrite the charitable tax deductible status claimed by corporate and high net-value individual donors to business friendly think-tanks in the country) has paid off in rightward policy changes and shifts in public opinion. Gutstein argues that right wing think-tanks and their allies are made more influential by a mainstream media echo chamber. He says an examination of the 2013 Canadian Newsstand Major Dailies database shows that research from right wing sources like the Fraser Institute appears more often than papers released by left and progressive think-tanks like the Canadian Centre for Policy Alternatives. 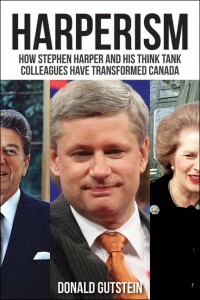 The tax-and-service-cutting gospel promoted by bodies like the Fraser Institute seems to have the compelling power of constant repetition and this may be one of the reasons, as this book suggests, that Harper and his colleagues have been as successful as they have been at changing the face of Canada. There are a few regrettable lapses of tone in this book, introducing an unnecessarily strident element to what is otherwise a calmly delivered and damning account that needs no such extra volume. But these are rare, and do no real damage to the sensible and quintessentially reasonable and Canadian tone of most of the text. In balance, this is one of the most important books on Canadian politics published so far this year, and required reading for us all before we vote in the next federal election. Whether you are persuaded by Gutstein’s arguments or not, you owe it to yourself to grapple with them before you vote. Tom Sandborn lives and writes in Vancouver. His home office has never been described as a think-tank. He welcomes feedback and story tips at tos65@telus.net.